Don Roberts is a peer supporter who runs the Never Alone Recovery Hall in Ronan. In recovery after struggling with mental illness and drug addiction for decades, he’s now trained to use his experience to help others recover themselves. There’s some hope around a folding table here, inside this smallish Main Street storefront in Ronan, Montana, at the Never Alone Recovery Center. Outside, it’s a sunny Tuesday evening in this 2,000-person, majority-white town on the Flathead Indian Reservation. Inside, a mixed-race group of men and women, passing around a bowl of candy, shoots the breeze for a few minutes before settling down to business. Roberts is what’s known as a peer supporter, someone who’s grappled with addiction or mental illness — in his case, both — and has found his way back to health and, with professional training, taken up the work of helping others do the same. It’s not a new idea. Peer support in various forms has been part of Alcoholics Anonymous-style programs for decades, as well as endorsed by everyone from mental health activists to federal health officials. But in Montana, it’s increasingly recognized as a bona fide profession, something that’s a key piece of the puzzle as hospitals, service providers and community groups try to do a better job of helping the tens of thousands of Montanans who struggle with behavioral health problems. The Tuesday evening meeting in Ronan is officially a SMART Recovery group, following a psychology-based curriculum that teaches people how to cope with addictive behaviors. But tonight, at least, Roberts is focused less on working through the curriculum than listening. As group members talk about how they’re doing trying to stay sober, he draws on personal experience to respond, trying to reassure them that they’re not alone in their struggle. If group members say they don’t like the way their medication for a mental disorder makes them feel, he talks about how he’s on medication for bipolar disorder himself, even though he’s tried unsuccessfully with medical supervision to wean himself off it. When someone says they’re worried about how their addiction is straining their relationship with a parent, he shares a story about how he didn’t see his mother before she died because he was serving a multi-year prison term. As the meeting continues, Roberts passes around a worksheet that asks attendees to list things in their life they can look to for inspiration or stress relief as they try to stay sober. One of his points is his two-year-old son — who he wants to provide with a better life than the one he had growing up. “Recovery is possible — and we’re examples of it,” said Jim Hajny, the executive director of Montana’s Peer Network and one of the state’s major advocates for peer support. Peer supporters, Hajny said, can bring their lived experiences to the table in a way that isn’t possible for mental health professionals who don’t have firsthand experience with the diseases their clients are facing. That means supporters can relate to things like being hospitalized after a suicide attempt or going through treatment — and, he said, serve as living reminders that life can in fact get better. That’s an idea backed up by formal research, too, with a 2011 review published by the Substance Abuse and Mental Health Services Administration listing dozens of studies documenting the benefits of peer-run programs like the Never Alone center, some dating as far back as the 70s and 80s. “The consumer-operated service model of peer support is now being recognized nationally and internationally,” it concluded. Last year, the Montana Legislature passed Senate Bill 62, which recognizes “behavioral health peer support specialists” as a formal profession. As the state board of behavioral health begins processing applications this summer, that means peer supporters will soon be licensed like social workers or addiction counselors. The idea is that adopting licensing requirements including standards for training and supervision will make it easier to maintain quality of care and incorporate peer supporters in Montana’s formal health institutions. It may also make it easier to fund peer support work through Medicaid or private insurance. “It puts the structure around the profession,” Hajny said. Roberts, in his mid-40s, sports tattooed forearms, a ponytail and a short, graying beard. With a family history of drug use, he started using meth when he was 13, he said, becoming a “full-blown addict” by the time he was a young adult. He started going to Narcotics Anonymous meetings when he was 18, but never committed to the program and never stayed clean for more than a few months at a stretch. He did multiple prison stints until a recovery program at a federal prison in Arizona took hold in his late 30s. Out of prison, his brother introduced him to the Mission Valley-area recovery crowd, where a Narcotics Anonymous sponsor encouraged him to go back to school. 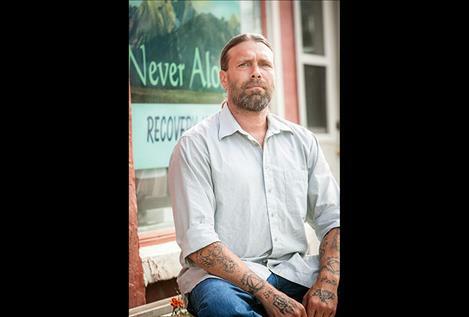 Now almost nine years clean, he’s finished a bachelor’s degree, is pursuing a master’s and works as an addiction counselor with the local drug court. Never Alone came out of a capstone project Roberts did while studying social work at Salish Kootenai College, inspired by a peer support training he attended in Missoula. Deciding a drop-in center would be valuable in Ronan, he asked around until he found a landlord willing to rent a vacant storefront, then filled it with donated furniture and a fridge. He runs the space on a shoestring budget, paying $50 a month for rent. The center keeps a deliberately full schedule, with different recovery groups scheduled each weeknight and social activities like crafts and camping trips on the weekends. A few people show up for specific groups, like a formal Narcotics Anonymous meeting on Wednesdays or a Native American-focused program on Fridays. Others just come every night they can, under the logic that every hour they spend at the recovery hall is an hour where it’s easier to stave off the temptation to get high. Never Alone works mostly with drug or alcohol addiction, but practitioners like Roberts and Hajny say peer support is an effective mental health tool, as well. It’s often hard to draw a clear distinction between addiction and mental illness. Hajny and the Peer Network, for example, ran a multi-year “recovery coaching program” in Bozeman, under the logic that involving peer supporters might be a more effective — and cheaper — way to respond in situations where law enforcement is called out to deal with people going through mental health crises that don’t necessarily involve criminal activity. In one case, Hajny wrote in a report, a mentally ill man was referred to the program after being involved in 29 law enforcement calls in six months. Meeting with him repeatedly at his home over several months, peer supporters were able to help him make progress with therapy, get on medications and find work. In all, the program’s team of two peer recovery coaches worked with roughly 100 Bozeman-area referrals in 18 months. Slightly more than half of those people were interested in meeting with peer supporters repeatedly. Housing someone in the state mental hospital, Hajny said, costs more than $500 a day. So a peer supporter who manages to work with just three clients a year to divert them from 60-day hospital stays saves taxpayers $90,000 — more than enough to cover their salary. When it comes to addiction, Roberts said, one key to escaping is changing your social environment, learning to connect with people over things that aren’t drugs or alcohol and letting go of relationships that pull you back into using. Part of the idea behind groups like Never Alone’s programs is that they can give people working toward recovery a welcoming place to find a healthier sort of fellowship — one that truly understands the battle they’re fighting.